Based on the memoir of Jane Wilde Hawking, "The Theory Of Everything" is a sparkling, open-hearted gem of a film, percolating with spirit, possibility and rebirth. Sometimes the film is too polished, but Eddie Redmayne brilliantly captures the spectrum of feeling, physicality and despair in his portrayal of legendary British theoretical physicist Stephen Hawking, who has Lou Gehrig's Disease, or ALS. The physical challenges don't impede the joy of science and physics. Yet James Marsh ("Man On Wire") directs a film more about the chemical imbalance of human relationships rather than unassailable quests for formula-driven achievements. 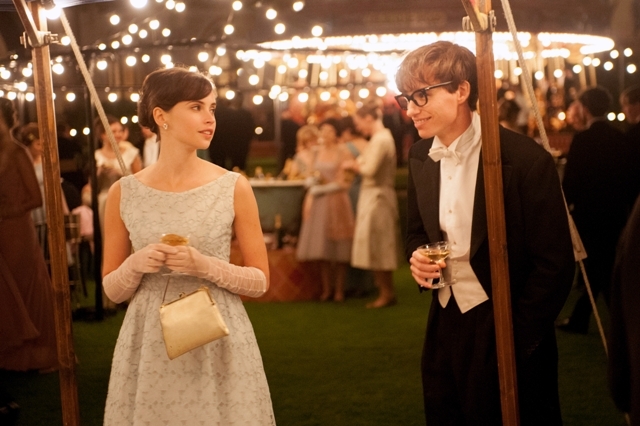 Jane (Felicity Jones) and Stephen meet soon after the film starts in Cambridge, England, where Mr. Hawking is a student and budding physicist. The love story begins, floats with a twinkle and effervescence before the hardships and adversities arrive. Mr. Hawking says a few nothings, and Jane smiles, entranced and taken with him. It's a potion that brews effortlessly. Then the drama comes. Much of "The Theory Of Everything" is shot beautifully by Benoit Delhomme in a fairy-tale golden light and overall brightness. In the most adverse situations there's a bit of a gleam in the film's eye that betrays some of the rawness and purity of Mr. and Mrs. Hawking's tribulations. Any long-standing accusations of misogyny in the world-renowned physicist are tamped down, while Ms. Hawking herself comes across as a risible and contemptible figure on occasion. I got the feeling she played a deeper role in the physicist's successes and stability than the film necessarily gives her credit for. What the film gets so very right is the mathematics of complex human relationships, the nuances and circumferences, if you will, of at least three people (including Jane's lover and eventual new husband Jonathan) who are isolated, lonely but manage to work collaboratively for mutual benefit. The film gives each their space, sympathy and private anguish but portrays Mr. Hawking as the source of much of it where Jane and Jonathan are concerned. Life isn't fair, but even for cinema's sake this trio of characters' alienation and empirical reasons for it feels truncated. Their plights at times felt too convenient, simplistic and surface-driven, but I appreciated the larger effort to convey how love, desire and passion for various things is sometimes denied or delayed. At least Mr. Marsh's (and screenwriter Anthony McCarten's) striving for balance and dexterity takes the focus off Mr. Redmayne's character and avoids miring him in pity. In part of the second and much of the third act the lead character is less a factor in the tale Mr. McCarten writes. The celluloid Hawking looks like a prop for Jane and Jonathan to cruelly bounce things off or slings things at. But both of them love and care about him, and the film is a triangular love story about compassion and compatibility. "The Theory Of Everything" isn't devoid of some of the usual flourishes or clichés you'd expect in films about living with disabilities and major impediments, but I think this enjoyable, absorbing and entertaining film succeeds largely in spite of itself. Mr. Hawking's charisma and atheism is on display but not enough of his cutting, caustic remarks are. Still, "Theory" captures the energy, curiosity and eternally youthful, boundless passion Mr. Hawking still has. It's a mischievous Hawking and a top-class performance from Mr. Redmayne, whom I've felt has been a fine actor for a long while. As Hawking he conveys silence, speech, mental acuity and stimulation of physics with care, choreography and verve. When I recently spoke to Mr. Redmayne about his portrayal he told me he had hired a choreographer to help him with the gradation of movement in the stages of Mr. Hawking's life. Mr. Redmayne had access to dailies so as to work on positioning and the degree of angle in movement of his character across different years in typically out-of-sequence filming. Mr. Redmayne's focus is keen, disciplined and it shows on screen. It's a mathematical, considered and well-structured performance that genuinely merits an Oscar nomination. I wish the character as written had gone even further with his passion for physics and debunking his own theories. Mr. McCarten's script, which ties love among people in a mathematical equation-like manner to the universe, is, in one or two areas, a bit of a let down. The process of cherry-picking from Ms. Hawking's memoir Travelling To Infinity may or may not have been a minefield or presented the filmmakers with a quandary. Admittedly films about figures with physical limitations, particularly notable figures, face a common challenge: portraying that figure without exploiting or martyring them into submission. I loved "The Diving Bell And The Butterfly" years ago but on reflection it may have suffered from this. In contrast "My Left Foot" had a purity, nakedness and non-romanticism "The Theory Of Everything" lacks. I felt something deep and unquenchable in "Left Foot": pride and guts. Different stories, yes, but it's worth noting that Mr. Hawking's early economic background wasn't so dissimilar to "Left Foot"'s Christy Brown's. A film like "Theory" could have gone a little more "dark", so to speak, than it does, but then again it may have been mawkish. It's a delicate, balance, which is finely struck. Aside from Mr. Redmayne's very good work all the performances are more than satisfactory, notably Ms. Jones ("Like Crazy"). You can't argue with the film's heart, even if, like any movie, "The Theory Of Everything", a magical, mystical and beautiful film, isn't perfect. Also with: Charlie Cox, Harry Lloyd, Simon McBurney, Emily Watson, David Thewlis, Charlotte Hope, Maxine Peake. "The Theory Of Everything" is rated PG-13 by the Motion Picture Association for some thematic elements and suggestive material. Its running time is two hours and three minutes.